What would you do if you were truly free? From poisoned soil to healthy food. Four years can make a lot of difference. Four years ago our hazelnut grove was a poisonous, ecological wasteland. When we bought the farm the grove produced: hazelnuts. It consumed: time, oil (ride on mower), pesticides, fertilisers, and herbicides. Now the grove produces: organic lamb, organic wool, organic hazelnuts, organic daffodils (to sell), organic apricots (we put some trees in that are doing well), organic eggs. It consumes: time to harvest the produce but no oil, herbicides, pesticides or fertilizers. 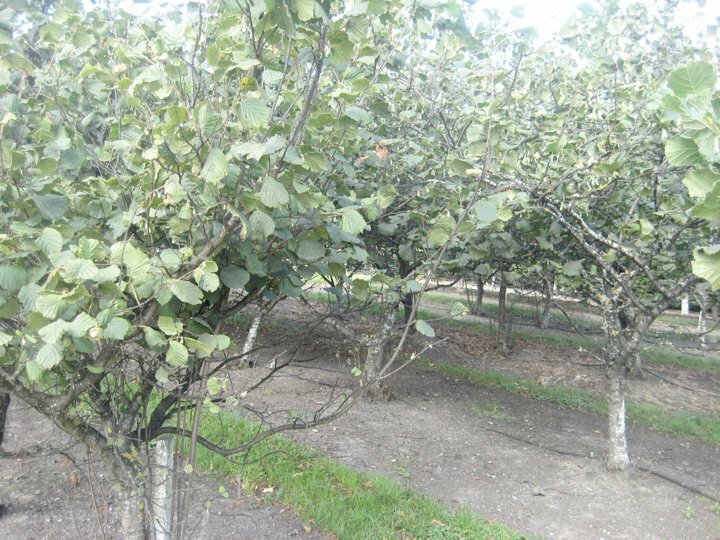 The huge swathes of bare ground beneath the trees in the photo above are typical of a conventionally managed nut plantation. Growers poison the ground beneath the trees so that machines can roll along and easily scoop the nuts up off the ground without grass getting in the way (you can see the bare earth of a conventional nut grove in a harvesting video here). The bare ground makes the whole process quick and easy. Not so good for the earth or consumers though. Nut groves use a lot of poison. We decided on a different path for the property when we bought it, and began to manage it on permaculture principles, which are organic and are common-sense – letting the land develop ways to take care of itself with minimum intervention from humans, and eventually create guilds of plants and animals that rely on and support one another naturally. Healthy soil, healthy trees, healthy animals. Our property has been just four years organic. 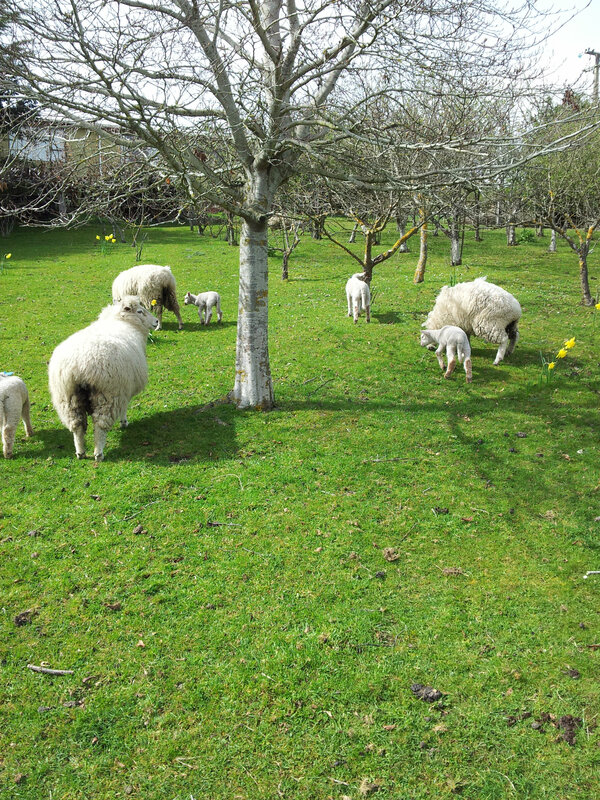 We fenced the grove so that our sheep could graze. Before this, the grove was open to the house and ungraze-able. This immediately gave us more crops from the same land: organic meat and wool. We then planted hundreds of bulbs to help break up the compacted earth and give us a secondary crop: flowers to sell. Next I built a chicken tractor to move along beneath the rows of hazelnuts. This helps manure the hazelnuts (along with the manure from the sheep) so we don’t have to fertilize them. It also gives us a further crop from the same piece of land: eggs from the chickens. Not only do we get fertilizer and eggs from the chickens, but the chickens keep insect pests and weeds down. Permaculture makes so much sense. You just have to think, and plan, and use your brain. These are all things we humans are good at. I think we’ve turned a place of ugliness into one of beauty and wellbeing. Awesome. It looks better. It sounds like a better and more productive system. I’d simply add that the chickens in the tractor also dig out the grubs and also aerate the land. Great job. Be prepared – having a farm is a VAST amount of work, on a scale I’d never imagined prior to owning one. Mine is about as small as you can get (3 acres) but there is always work to be done. It never ends. It’s very rewarding but unless you want to work outdoors 20 hours a week on top of your day job, it’s something to really carefully consider. – Fencing. Fences are always going down, needing mending, having to get replaced and upgraded etc. It’s a lot of work. – Chopping wood and chainsawing. We’ve been losing a lot of big trees. The storms in this part of the world have been getting more severe over the last few years, and whole trees getting uprooted. When a 100 foot tall tree goes down, it’s a LOT of work to chop up, tidy up and sort out. – General animal maintenance. Shearers have been very unreliable, as they always go after the big farms first, then do the work for the small farms like ours last. They don’t turn up when they’re supposed to, do when they’re not, and you have to schedule weeks around them and when they might turn up. – Other animal wellbeing. I’ve learned how to vaccinate, drench, nail clip, tail, castrate…the list goes on. I’m also adept at killing stock. It all has to be done. – Planting trees. I’ve probably planted about 100 trees since being here. Digging holes is hard work! – Feeding and cleaning out animals. Just regular feeding and animal care. It’s not a big job, but if we go away even for a few days we need to organise a house sitter to feed and water the animals. – Burning off. Regular burn offs of cuttings too big to mulch or compost. We do about 5-10 a year. – Dealing with pest animals. We’ve had problems with a neighbour’s dog that got onto our property and chased and killed our lambs last year, and another neighbour’s dog that looked to be doing the same this year. We’ve also had problems with possums (eating young plants) and sheep from neighbouring farms coming through our front gate. – Dealing with rams. To get lambs you need a ram. Rams can get nasty and scary. Dealing with a 100 kg (220 lb) animal running at you and bowling you over is pretty hair raising at times! – Building stuff. I’ve had to re-roof chicken coops, build chicken tractors, build beehives, build farm gates, re-gravel driveways, build outdoor steps, remove a swimming pool, put in new water troughs and associated plumbing…you name it! Having a farm is pretty hands on. So that’s just some of the stuff I do on a regular basis. Yep. Owning a farm is hard work! Bravo! What a happy looking photo – nature in sync. I had no idea that traditional farming poisoned the ground of a nut grove. All the more reason to buy organic when possible. Conventional nut farms are really heavy users of chemicals – I had no idea until we bought a farm that incorporated a hazelnut grove as part of it (about 70-80 trees). Until then I guess I’d figured they might spray a *bit*, but not hugely. Boy was I wrong! And ours was unusual – usually the ground beneath wouldn’t have even had those green strips. It’s just that being a small operation, to save money they didn’t spray completely, so they left the soil unsprayed where nuts were less likely to fall. In big operations they’d blanket spray the lot. Some crops make little difference with organic, but with nuts there’s a huge difference. I have always said that our progress is not. By planting one crop and using ‘progress’ to harvest is limiting. I’m all in favour of your idea of multiple crops from the same land.